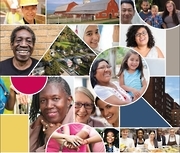 posted 1/31/19 -- The National Community Action Partnership released today the first National Community Action Impact Report: Building Opportunities for All. This unique and comprehensive report looks at how Community Action Agencies across the country impact the lives of 15 million people each year, creating pathways to prosperity. The Community Action Network is robust local force of 1,000 local Community Action Agencies, reaching children and families in 99 percent of all U.S. counties. Agencies connect families to approaches that help them succeed and promote community-wide solutions to seemingly stubborn challenges in cities, suburban, and rural communities. This report outlines the needs families face in today's uneven economy, the reach of Community Action coast to coast, and the impact Community Action has in communities every day. "This report tells the broad story of Community Action and all of the incredible ways our members are making an impact in their local communities," said Denise Harlow, Chief Executive Officer of the National Community Action Partnership. "For 55 years, our network has developed innovative solutions to improve family well-being and directly impact and engage local communities." "Community Action addresses a number of factors that contribute to poverty, and it does so at the local level," said Harlow. "Our network's holistic approach to assist families in their journey to economic security is inspiring. We believe this report illustrates how their work strengthens lives, improves communities, and makes America a better place to live."